The IndyMac failure will take a chunk out of the fund the FDIC has to insure deposits. But bank experts aren't worried about it running out of money. 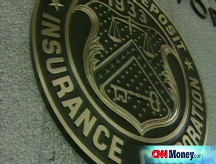 NEW YORK (CNNMoney.com) -- The FDIC has gone out of its way to stress that most banks are safe. But how safe is the FDIC? Shelia Bair, the chairman of the Federal Deposit Insurance Corp., said last week that she believes the takeover of the bank IndyMac, which the FDIC seized on July 11, will cost between $4 billion and $8 billion. The FDIC currently has a record $53 billion at its disposal in a fund to payoff customers of failed banks like IndyMac. Bair said the premiums that banks pay into this fund will have to be raised due to the hit it is taking from IndyMac. But she said there is no reason for taxpayers or bank customers to worry about the soundness of the FDIC. Most financial experts agree that the FDIC is well positioned to weather the expected increase in failures. "Most of the banks likely to fail are smaller institutions that will cost the FDIC very little to resolve," said Jaret Seiberg, financial services analyst for policy research firm Stanford Group. But knowing what bank could fall apart next is difficult if not impossible to predict, said William Isaac, the FDIC chairman from 1981 to 1985. "When we made projections on failures at the start of the year, we usually had the total number about right, but we had the institutions all wrong," he said. To that end, he points out that IndyMac probably wasn't even on the FDIC's watch list of problem banks as of the end of March. The agency releases the number of banks on that watch list, along with their combined assets. But it keeps the names of the institutions secret so as not to cause a loss of customer confidence and a run on deposits. According to the first quarter report, the 90 banks on the problem list had total assets of $26 billion. But IndyMac had assets of $32 billion at the time it failed, which implies it wasn't considered at risk of failure only a few months ago. "What I worry about is if you have a prolonged downturn, you have banks all over the country, large and once strong institutions, going down," said Isaac. "That's what we saw in the 1980s." The widespread failures of hundreds of thrifts during the savings and loan crisis of the late 1980s and early 1990s ended up costing taxpayers about $250 billion in today's dollars, according to some estimates. That's because an FDIC-like fund in place to insure thrift deposits was overwhelmed at the time. While another collapse of that magnitude is not being predicted by most experts, some top banking analysts worry about the outlook for some of the nation's major banks and thrifts, institutions that dwarf IndyMac in size. Richard Bove, an influential banking analyst with Ladenburg Thalmann, wrote in a note last week that Washington Mutual (WM, Fortune 500), the nation's largest thrift with assets of $320 billion, is on the edge of the "danger zone." WaMu and another bank mentioned in his notes, Cleveland-based National City (NCC, Fortune 500), took the unusual step of making statements to assure customers and investors about their continued viability. National City has assets of $155 billion. Bove later issued a statement clarifying that none of the banks he covers are in immediate danger of failing. Another influential banking analyst, Oppenheimer's Meredith Whitney, raised concerns about Wachovia (WB, Fortune 500), the nation's No. 4 bank with assets of $808 billion. In a note last week, she wrote that Wachovia will face the "greatest reckoning" in the coming quarters due to surging credit costs. WaMu, National City and Wachovia are all expected to report losses for the second quarter when they release their results this week. Still, in the unlikely event that one of these giant banks fail, Seiberg and Isaac said that does not necessarily mean they would cost the FDIC more than the IndyMac takeover. IndyMac specialized in risky mortgage loans to borrowers who were not forced to verify their income. Those loans have little value in the current financial market, making the cost of that failure more expensive than it might be for a more diversified bank. But even if there are more expensive bank failures, the FDIC will likely be able to handle the cost of them without resorting to taxpayer funds. Seiberg said banks won't squawk too loudly about rising FDIC premiums. Just as homeowners feel better about paying insurance at a time there are fires burning through their neighborhood, the banks are likely to be grateful for the assurance the FDIC provides for their customers and business. "Anything that diverts money from the bottom line is not welcome. But the alternative - having an insurance fund perceived as inadequate - would be far worse," he said.